Henry and Catherine Tilney are content with their married life: a comfortable parsonage, their dogs, and one another. The idea of returning to Bath a year after they first met there seems like it can only add to their happiness; but Catherine finds that Bath still carries social dangers that she must learn to navigate. What is the nature of Henry's past relationship with a beautiful young woman? Why is a rakish baronet paying Catherine such particular attention? Is General Tilney going to marry the woman known in Bath as The Merry Widow-and what did she have to do with her husband's death? And will Henry ever be able to keep his Newfoundland out of the river? Revisit the winter pleasures of Georgian Bath with your favorite characters from Jane Austen's hilarious Northanger Abbey, and prepare for a bit of romance, a bit of mystery, and a very nice story indeed! 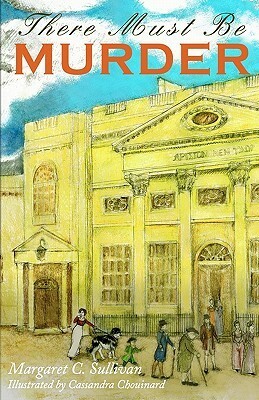 I've said a number of times that I think Northanger Abbey is vastly underrated, both by the general public and by Janeites themselves. I've also said many times that I think it gives the best idea of Austen's personality and playfulness, and I think it feels the most like what it would have been like to know Austen and be friends with her. So needless to say, there are not enough Northanger etellings out there for my liking. On the one hand, this makes sense, and not just because it's underappreciated; Northanger Abbey is a book that hinges on a silly moment of a very young character, and in the end, feels complete. There's not as much wiggle room there to play with in adaptations, or at least, not in the way that many adaptations tend to go. Nevertheless, when I see a Northanger adaptation pop up, I am all over it, so of course I was super excited when Maggie Sullivan (author of last year's "Heroic Ranking Index" post) sent me her latest, the intriguingly-titled, There Must Be Murder. And what I found was a really solid, quick read for fans of Henry and Catherine. One playful enough and with that same sense of humor and observation that made me love its original, while poking fun enough that I think even those who found Northanger too silly will still appreciate this one. Sullivan does a good job when it comes to recreating the characters and their experience of Bath, but also of progressing the stories and lives of those same characters. Those that found Catherine to be unbearably silly and frivolous will see that she's shown growth, though her spirit and penchant for ridiculous drama is still there. But as I always liked Catherine, the thing the story hinged on for me was the relationship, and it was strong on that score as well. The way Catherine and Henry interacted was charming and a believable progression from the end of Northanger. I've seen many discussions where people doubt their relationship and its potential for happiness, questioning whether Henry would remain interested in someone as flighty as Catherine. I've always thought they were very well-suited, and could see Henry happily teasing Catherine well into old age; this embraces that dynamic and showcases how well they work together. It's really nice, and with some of that characteristic sly style Austen has, but also with a more modern flirtiness to it. Um. That was a tangent... ANYWAY, I really think that Catherine and Henry could have a whole host of interesting adventures in Margaret C. Sullivan's hands, and I definitely hope to see more. The only real drawback for me was that it wraps up a little too swiftly and neatly. I would have liked a little more dwelling on the "mystery" that Catherine finds herself embroiled in, and the darker, gothic aspects that are such a hallmark of Catherine's sensibility. There was potential to lengthen and make the most of the drama, but instead, it felt like Sullivan pulled back a touch, maybe trying to avoid those same pitfalls that make so many readers speak a little disparagingly of Northanger. Whatever the reason, I could have done with a little more on that score, but it doesn't change the fact that this was a thoroughly enjoyable, very quick, fun read. 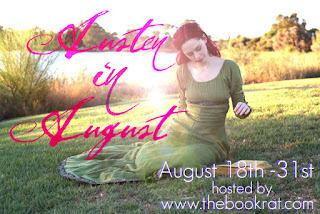 Click the pic to be taken to the Austen in August Main Page!Thanks to faestock & inadesign for the images used to create this button. Though Northanger isn't near the top of my list of Austen favs, I still really like it. I love the idea of a sequel to revisit Henry and Catherine. I really enjoyed There Must Be Murder. It was super fun and felt very in keeping with the original to me. You're right that Northanger is underrated. It's not my favorite, but I loved it. Would love to see more sequels and retellings. Ah, I love Northanger Abbey. It was one of the first books I read by Austen, and I always felt a kinship with Catherine. I totally agree about getting Austen's personality, since she is constantly addressing the reader as the narrator--I loved that! I'll have to look for this one.